Schedule pods that failed to run on any of the current nodes due to insufficient resources. Ensure that frequent scaling pods won’t have to wait for instances to launch (see Headroom section for more details). Ensure that cluster resources are optimally utilized. Spotinst Ocean makes sure that all pods in the cluster have a place and capacity to run, regardless of the current cluster’s load. Moreover, it ensures that there are no underutilized nodes in the cluster. 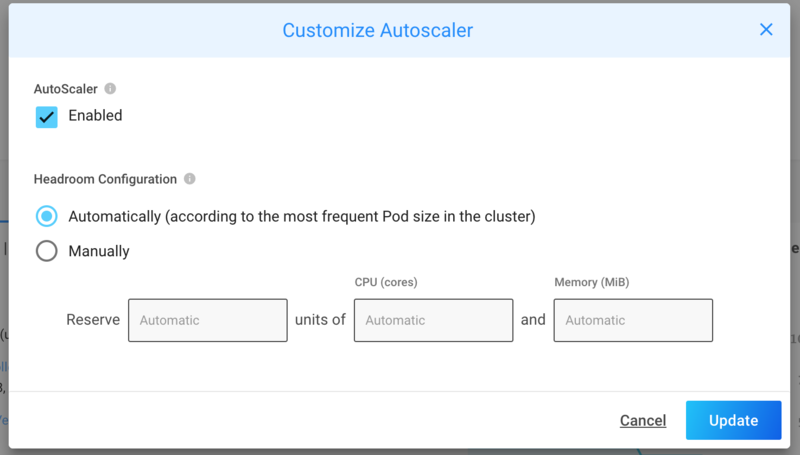 Metric-based cluster autoscalers are not aware of Pods when scaling up and down. As a result, they may add a node that will not have any Pods, or remove a node that has some system-critical pods on it, like kube-dns. Usage of these autoscalers with Kubernetes is discouraged. Ocean checks for any unschedulable pods every 10 seconds. A pod is unschedulable when the Kubernetes scheduler is unable to find a node that can accommodate the pod, this can be happening due to insufficient CPU, Memory, GPU or custom Resource. For example, When a pod request more CPU than what is available on any of the cluster nodes. Unschedulable pods are recognized by their PodCondition. Whenever a Kubernetes scheduler fails to find a place to run a pod, it sets “schedulable” PodCondition to false and reason to “unschedulable“. Ocean calculates and aggregates the number of unschedulable Pods waiting to be placed and finds the optimal nodes for the job. Ocean makes sure that all the pods will have enough resources to be placed, it also makes sure to distribute the Pods on the most efficient number of VMs from the desired cloud provider. In some scenarios, it will prefer to provide a distribution of certain machines types and sizes based on the Pods requirements and the Spot / Preemptible VMs prices in the relevant region. It may take a few moments before the created nodes join the Kubernetes cluster, in order to minimize this time (to zero) you can read more about Cluster Headroom. Ocean constantly checks which nodes are unneeded in the cluster. Ocean simulates the cluster’s topology and state “post” the scale-down activity and decides whether the action can be executed or not. Pods with restrictive PodDisruptionBudget will be evicted gradually if the scale down will cause a violation of the disruption budget, Ocean will not scale down the node. Pods that are not backed by a controller object (so not created by deployment, replica set, job, stateful set etc). Ocean ensures that pods and nodes are gracefully terminated in a case of scale-down or an instance replacement. For pods with PDB, Ocean performs the eviction in chunks and makes sure that it won’t interfere with the minimal budget configured (For example a PDB .spec.minAvailable is 3, while there are 5 pods, 4 of them run on the node that is about to get scaled down; Ocean will evict 2 pods, wait for health signal and move to the next 2. Oceans provides draining timeout of 120 seconds by default (configurable) for every Pod before terminating it. Ocean provides the option to include a buffer of spare capacity (vCPU and memory resources) known as headroom. Headroom ensures that the cluster has the capacity to quickly scale more Pods without waiting for new nodes to be provisioned. Ocean optimally manages the headroom to provide the best possible cost/performance balance. However, headroom may also be manually configured to support any use case. Ocean manages the cluster capacity to ensure all pods are running and that resources are utilized. If you wish to override the default configuration, you can customize the scaling configuration. Ocean allow dynamic resource allocation to fit the pods’ needs. Ocean cluster resources are limited to 1000 CPU cores and 4000 GB memory by default, this can be customized via the cluster creation and edit wizards.